LONDON--(BUSINESS WIRE)-- Technavio’s latest market research report on the global genome editing market provides an analysis of the most important trends expected to impact the market outlook from 2018-2022. Technavio defines an emerging trend as a factor that has the potential to significantly impact the market and contribute to its growth or decline. 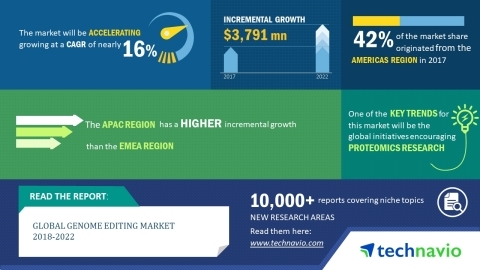 According to Technavio market research analysts, the global genome editing market will grow at a CAGR of approximately 16% during the forecast period. The increase in applications of genome editing in therapeutics is a major factor driving the market’s growth. The prevalence of chronic and infectious diseases such as malaria, tuberculosis, HIV/AIDS, and hepatitis has rapidly increased. Genome editing can provide therapeutic tools for this disease. CRISPR technologies can provide anti-retroviral therapies to inhibit the virus with reduced treatment interventions. For instance, genome editing can target host-dependent factors such as the co-receptor CCR5, thereby preventing the cellular entry of this virus. Hence, the rise in prevalence of diseases increases the demand for novel therapies using genome editing tools, thereby contributing to the growth of the market. Research and academic institutions around the globe are collaborating to understand proteins through the exchange of knowledge and molecular biology techniques involved in proteomics research. In 2012, a global project on genome was initiated, which is an ongoing research project. A major organization is facilitating and serving as the mediator in this project. This organization is an international consortium of national proteomics research associations, government researchers, academic institutions, and industry partners. “The goal of the genome project is to experimentally observe all proteins produced by sequences translated by the human genome. Such projects will increase the use of genome editing tools. CRISPR-Cas9 gene editing tools can be combined with functional proteomics to explore mechanism-based diagnostics and disease interventions,” says a senior analyst at Technavio for research on health and wellness. This market research report segments the global genome editing market into the following end-users (biotechnology and pharmaceutical companies, academic institutes and research laboratories, and CROs) and key regions (the Americas, APAC, and EMEA). In 2017, the biotechnology and pharmaceutical companies segment was the leading revenue contributor to the global genome editing market. The driving factors for this segment are the prevalence of chronic diseases and the increase in the use of genomic editing tools for research on drug discovery. The Americas was the leading region for the global genome editing market in 2017, accounting for a market share of more than 42%. It was followed by EMEA and APAC. The APAC region is expected to grow steadily when compared with the other two regions.